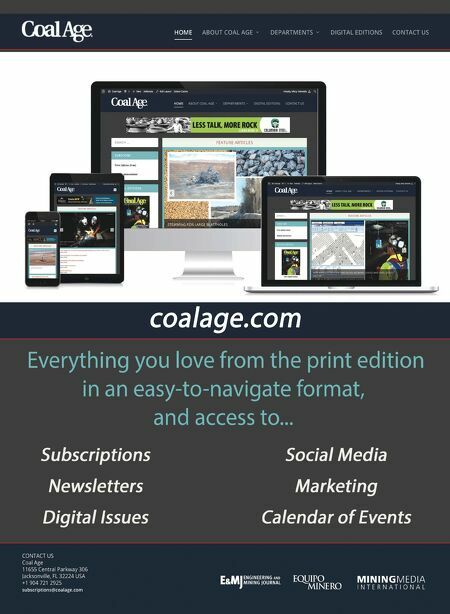 20 www.coalage.com November 2018 autonomous haulage systems continued sensors, act as a heartbeat," Cook said. "The system is looking for data at least once a second. The truck will slow down if the system is not getting confirmation signals from those sensors." During system development, Modular performs a stability test. "Once we have a software candidate for release, we will con- duct thousands of tests, troubleshooting everything, not just the custom changes we made for this particular system," Cook said. "If an unexplained event occurs in the field after the system is in- stalled, we try to replicate it here and troubleshoot it." FrontRunner looks for the commands from Dispatch. The truck gets its assignment as far as dig or dump location. It gets kicked out from the shovel and goes to the assigned dump point, dumps and then waits for the return assignment. "We work with dynamic assignments," Cook said. "If something happens in the cycle where the digging goes down, Dispatch reassigns the trucks automatically." Whether it's loaded or empty, each truck projects a path based on its momentum. "The trucks are using those paths as permis- sion," Cook said. "They are buying real estate ahead of them and releasing it behind them. Two trucks can't own the same piece of real estate. Each vehicle has a safety bubble that protects the driv- er. Manned vehicle interactions, passing and travel modes, cause the trucks to stop or at least change its characteristics, such as slowing it down." Komatsu recently organized a third-party hack to find vulner- abilities. "Wi-Fi is the weak point," Cook said. "To protect against that, we have a number of firewalls. Most mines operate in rath- er remote locations and the hackers would have to be physically present near the site. It's not so easy to get to the Pilbara or the Canadian oil sands. What we determined is that, if there were a problem, it would most likely be an internal issue." The biggest fear, Cook explained, would be ransom software. "If they took control of the system, they could try to extort mon- ey," Cook said. "But, the system is backed up, so we could shut it down and reload it." When it comes to double-sided loading, a lot of manned-op- erations claim they are using it, but the results are not nearly as repeatable as autonomous operations. In the future, manned operations could take advantage of guided spotting, a technique that guides operators to the optimum loading location. "We are past proof of concept on this technology and it's truck agnostic," Cook said. "The second phase will feed information into a ma- chine controller, which would allow a manned truck to be backed into position autonomously." "With autonomous mining, the mines face a choice," Cook said. "They can produce more tons with the same spread. Or, they can park equipment and produce the same amount. Everything is site specific, but a typical operation that would be using 18 trucks might be able to do the same thing with 15 trucks. That varies with haul and ramp distances." Mixed Fleets vs. Interoperability The Komatsu AHS can coexist with manned vehicles (mixed fleets) and other makes and models (interoperability). "There are usually some issues with mixed fleets around the dump zone," Cook said. "When the manned truck makes a mistake, the au- tonomous truck will view that as an obstacle. Most of the dumps are large and they can be easily divided into manned and auton- omous operations. But, certainly around the crusher and on the haul roads, we can operate manned and autonomous trucks at the same time." As far as interoperability, Cook said that, when it comes to AHS, Modular is squarely focused on Komatsu trucks. "Our position on retrofitting other manufacturer's trucks? It's too much of a risk. Look at the airlines, they both operate with GPS, radar and lasers, but Boeing won't retrofit its guidance system on the Airbus." "There are companies that are retrofitting systems to sever- al makes and models, but that's not true interoperability," Cook said. "True interoperability is being able to pass through industry protocols, which agree on how information is sent from central control to agnostic vehicles. Safety is a big concern here." The Dispatch system is working with roughly 130 autono- mous trucks worldwide, Cook explained. 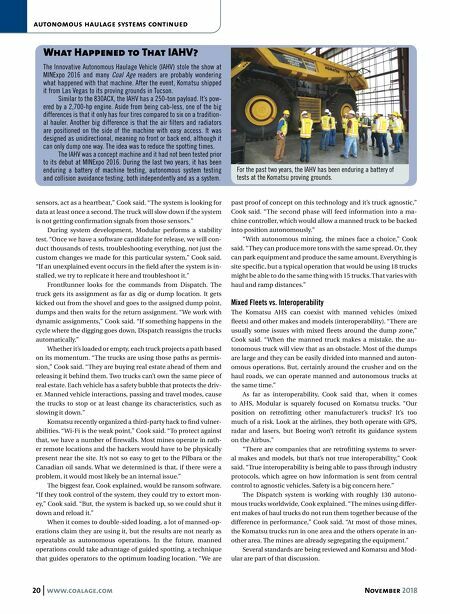 "The mines using differ- ent makes of haul trucks do not run them together because of the difference in performance," Cook said. "At most of those mines, the Komatsu trucks run in one area and the others operate in an- other area. The mines are already segregating the equipment." Several standards are being reviewed and Komatsu and Mod- ular are part of that discussion. What Happened to That IAHV? The Innovative Autonomous Haulage Vehicle (IAHV) stole the show at MINExpo 2016 and many Coal Age readers are probably wondering what happened with that machine. After the event, Komatsu shipped it from Las Vegas to its proving grounds in Tucson. Similar to the 830ACX, the IAHV has a 250-ton payload. It's pow- ered by a 2,700-hp engine. Aside from being cab-less, one of the big differences is that it only has four tires compared to six on a tradition- al hauler. Another big difference is that the air filters and radiators are positioned on the side of the machine with easy access. It was designed as unidirectional, meaning no front or back end, although it can only dump one way. The idea was to reduce the spotting times. The IAHV was a concept machine and it had not been tested prior to its debut at MINExpo 2016. During the last two years, it has been enduring a battery of machine testing, autonomous system testing and collision avoidance testing, both independently and as a system. For the past two years, the IAHV has been enduring a battery of tests at the Komatsu proving grounds.